In February 2009 we spent 10 days in Arizona. The first five nights we travelled to northern Arizona – to the Canyons of the Colorado Plateau. Our route took us first to Grand Canyon village where we stayed only metres away from the southern rim, then Monument Valley where we spent the night in the newly built Navajo Hotel. We were too late to see the sunset, but woke before dawn to experience the changing colour of the land as the sun rose. Day three we walked into Canyon de Chelly – that night staying in nearby Thunderbird Lodge. The following morning we followed the edge of the Painted Desert south then drove through the Petrified Forest National Park. On our final day we left behind the plateau – drove through the crater country, descended the Mogollon Ridge, and south to Phoenix. After three days of art in Phoenix we drove north again, hoping to walk in the red rock country of Sedona. We stayed overnight in Arcosanti, an amazing building project conceived by the architect, Soleri, but at this point the weather broke. We drove through Sedona, glimpsing the mountains through mist. Snow began to fall heavily and made it impossible to drive further north, so we stayed the night in a motel with other stranded travellers. The following day we retreated south again to Phoenix and our flight home. During this frenetic journey, we always seemed to be on the move and continually diverted from our route by ancient ancestral sites. My perceptions were heightened by the constant changing colours of the land as we drove, although my notes were simply scribbles of colour with crayons. At times, the complexity and grandeur of the land and the subtleties of hue seemed impossible to capture so at times I resorted to words – hoping to make sense of it later. This book evolved from the colours and patterns I tried to record – fragments of photographs, scribbles, and words which try to interpret my impressions of the place and the journey. 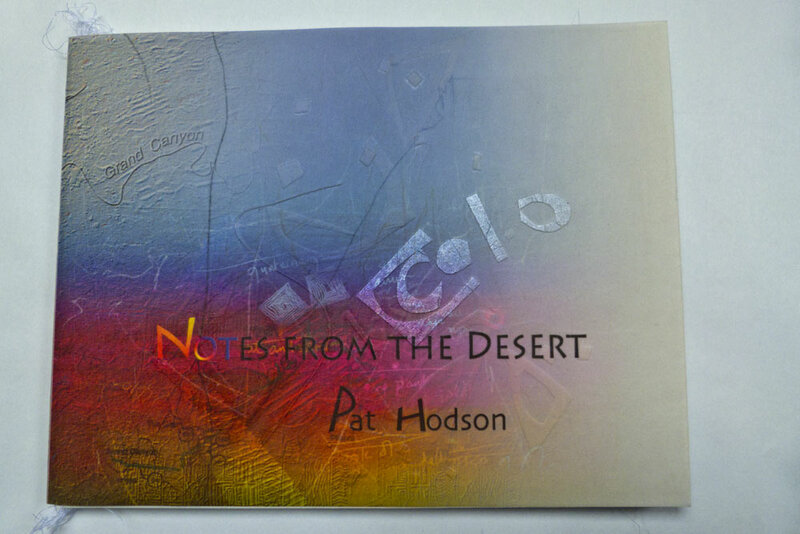 Notes from the Desert was printed first as a unique collage book, then 8 paper copies were printed for the first edition, using the same format ( continuous fold book); One special copy having unique cover. 10 folio pages, folded at the foredge, stitched in the gutter. The second edition, (signed numbered copies) is published in pamphlet format. Pigment Printed, sewn and signed copies on Innova Cotton High White double sided Paper. The original digital images are used, with superb colour and print quality.